♣IMPROVED YOUR DOG\'S VISIBILITY & SAFETY. Ultra Bright RECHARGEABLE Collars Make Your Pet Visible to All. Avoiding Your Pet be Hit by Car in the Darkness. Prevents Accidents and Keeps Them Safe. 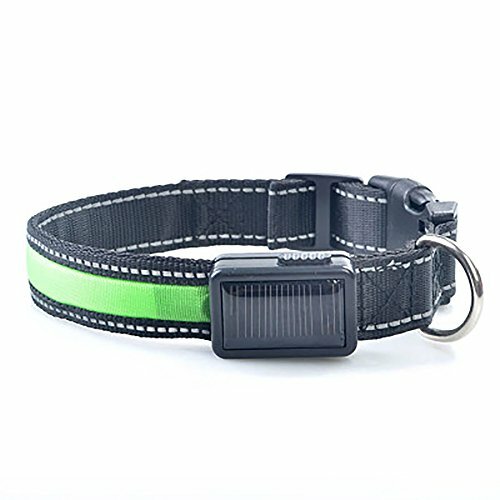 ♣NEW ENERGY TECHNOLOGY DOG COLLAR WITH REFLECTIVE TAPE! USB & SOLAR Rechargeable Battery (cable included) Gives 3 Hours Plus of Illumination Per 2-hour Charge. In the SUNNY DAYS, NO Need USB, Solar Charged IN THE SUN for 8 Hours Can be Full Power! ♣7 Colors(Blue, White, Red, Orange, Yellow, Green, Pink). 3 Modes(continuous light, strobe, off). 3 Sizes(S: 13-16\", M: 16-19\", L: 19-23\") Can be Resized for 5cm of S and 10cm of M, L. 2 Charging Methods(USB, Solar). 1\" Wide. ♣MATERIAL: Products Using LED Energy-saving Lamps and Fiber Combined with the Halo Generated, Light Effects of Uniform. Very Suitable for Pet with a Night Walk. The Outside is Woven From Fishing Wire, Not Only Light Effect is Superior, But also Very Solid!